Let’s face it, any man loves a gadget. We love having ‘stuff’ that makes life easier, things we can show off to our buddies, things that make us look cleverer than our peers. But one category of gadget makes us feel almost super-human! 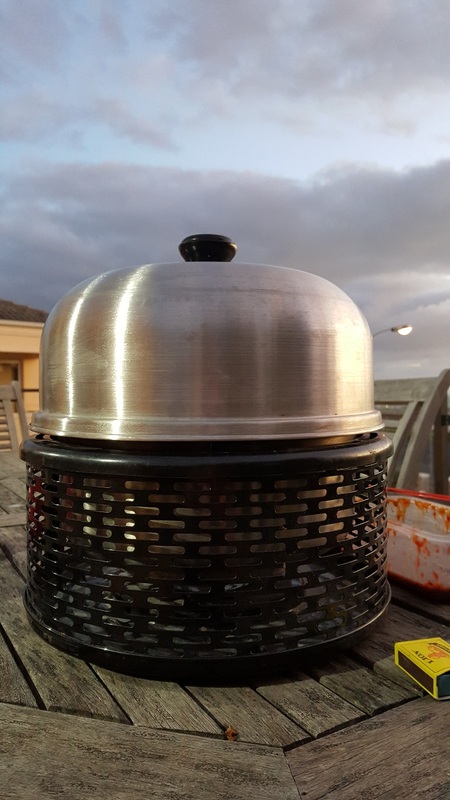 I am talking off course about the braai gadget – it ticks all the boxes above with the added bonus of giving us something yummy to eat at the end of it all. Unfortunately the truth about most gadgets is that they are just that…. a gadget, a toy and more often than not, an over-complicated solution to a problem that didn’t really exist in the first place. They become an irritation that eventually finds its way down to the cupboard under the stairs to gather dust and take up space. The Cobb however is a little bit different. This is not just some braai gadget, this is a tool that allows the user to roast, braai or smoke all kinds of things in ways that will have your mouth watering! Originally developed to help people in rural Africa cook more easily and fuel efficiently, without the danger of out of control fires. Original versions of the device were heavy ceramic spheres that were fueled by dried corn cobs – which is where it got the name. Today the Cobb is a completely different animal, with a host of optional accessories and attachments allowing the user to cook just about anything. The Cobb Pro is, despite the ‘Pro’ in its name, the entry level model in the Cobb range – Despite this, it has a very high quality feel about all its components. Everything fits together just as it should, with none of those flimsy feeling details that sometimes ruin an otherwise great product. The main cooking vessel is covered with a round stainless steel dome, which sits on top of the stainless steel firebox. The firebox itself has a coal basket in the middle which is surrounded by a moat. The moat is quite useful for putting liquids ,such as wine, in to ensure your food doesn’t get dried out while cooking, or to obviously add more flavour. It can also be used to cook veggies, with flavourful drippings rolling off the griddle down to the moat. The firebox is topped with a non-stick griddle plate, on which you would mainly cook. As mentioned the griddle plate has holes leading down to the firebox and channels any liquids to the moat below. The entire contraption sits inside an enamel coated steel basket which not only gives it a very stable base, but also means that the the unit is completely safe to handle, even while cooking. Although Cobb will sell you their own specifically developed ‘cobblestone’ fuel coals, the Cobb is quite happy to work with with normal briquettes. And this is where the Cobb truly shows the genius of its design. The Cobb is designed to be used with the dome closed, thus keeping the heat inside and maximizing fuel efficiency – in fact the Cobb can easily roast food at around 180-200 degrees for up to 2 hours using ONLY 10 briquettes! Once the coals are ready, you simply drop the griddle plate onto the Cobb, place your food on the griddle and close the dome. This is where the Cobb takes a little bit of getting used to…. and a little bit of trust! You have to get used to the idea of closing the dome and letting the Cobb do its thing, open the lid too often and it will not be able to build up temperature and cook the food properly. Luckily, once you have done 2 or 3 cooks with it, you start to learn the timing and it gets easier the more you use it. So although it can be tricky at first, and I can confess that my first attempt at cooking chicken in the Cobb can only be described as a complete disaster and a very close call with salmonella! Now that I’m used to it though, I can not stress enough how amazing the results can be once you figure out exactly how to time your cooking. A couple of things worth mentioning however; The dome is not as high or as big as it might look, so when doing larger joints of meat for example, you may want to seriously consider getting the extension ring, which just lifts the dome that little bit extra to give you more room inside. Another point worth mentioning is that the griddle plate, although functional, has not been my preferred method of cooking in my Cobb. I almost ALWAYS use the optional roasting rack, which holds the food about 10mm above the griddle plate and prevents your bastings etc from burning on the hot griddle plate. Since you have to keep the Cobb closed for about 20 mins at a time, it makes it difficult to turn your meat etc every few minutes to prevent burning on the griddle – the roasting rack completely eliminates this problem and gives you nice even cooking without burning anything. My final recommendation would be to experiment with the Cobb – put wines, ciders, beers or stocks into the moat and cook something to infuse the flavours – Soak some oak shavings in water for 20 minutes and add them to your coals just before you put the griddle on to give your food the most amazing smokey flavours. The more you play with it, the more combinations you will discover that work for you. Have a good look at the list of accessories as well, there are many to choose from and you won’t need all of them, but there might be something specifically that speaks to you, the range gives you many many options. On the negative sides, yes the Cobb does take some getting used to and it is very important to make notes of your timings and the weights of your meat or veg to make sure you adjust the timing appropriately when cooking. Cleaning the unit can also be a little bit of a chore if, like me, you like to have some food with your basting sauce rather than the other way around. The sauces can burn onto the sides at the bottom of the Cobb since it would be right next to the fire box in the bottom. The griddle itself though, cleans fairly easily since it is non-stick on top. Finally, the size of the unit can be an issue for some. I can comfortably cook enough food for 4-6 people on my Cobb, but any more than that and you may want to consider the larger Cobb Supreme, which has a grid surface area roughly 150% the size of the Cobb Pro. The final result is cooked beautifully and smoked to perfection! I thoroughly enjoy my Cobb every time I use it – and it gets used often! To me, there is no better way of cooking chicken or fish, and let’s just say my Christmas Gammon has been legendary since owning the Cobb. It really does cook in a way that enhances the taste of your foods, especially if you enjoy smokey flavours. Once you have your timings figured out, it is very simple and easy to use, and it becomes a talking point with company every time you take it out. Previous post: Land yourself in some hot water!